This is the Swedish paperback edition of Talking God, the ninth book in Tony Hillerman's Navajo Mystery Series. 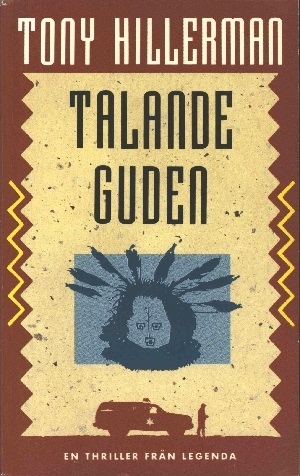 This 1991 paperback edition was published in Stockholm, Sweden by Legenda. The text was translated from English to Swedish by Karl G. and Lilian Fredriksson. The cover art, a reproduction of the design from the dustcover of the 1990 hardback edition, was created by John Eyre and features the mask of Talking God above a silhouette of a Navajo Tribal Police vehicle with a man standing in front. The edges of the illustration are modified to convey a Navajo rug design. Format: Paperback, 17.7x 11 cm. Binding: Full color paper covers with the author, title and publisher's device printed vertically in yellow on the spine.